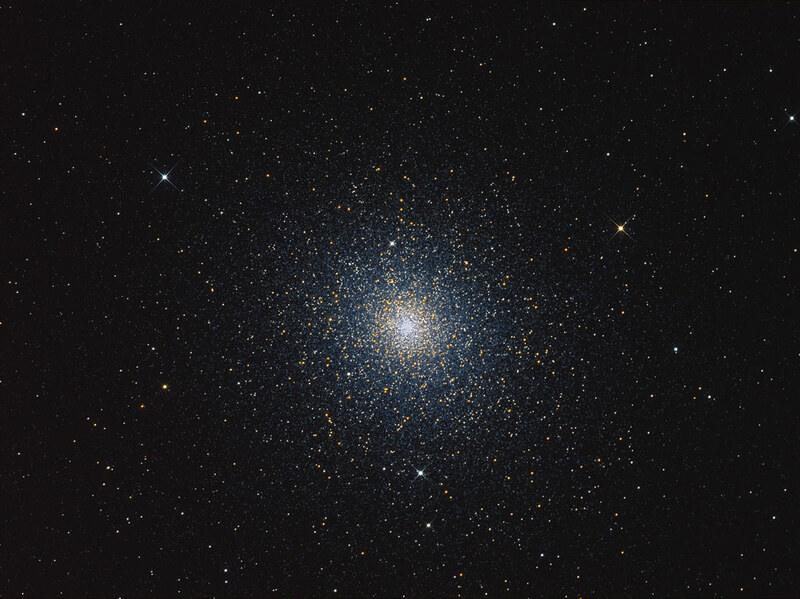 47 Tucanae (also known under Bayer's designation ξ Tucanae, or NGC 104) is a globular cluster in the southern constellation Tucana. 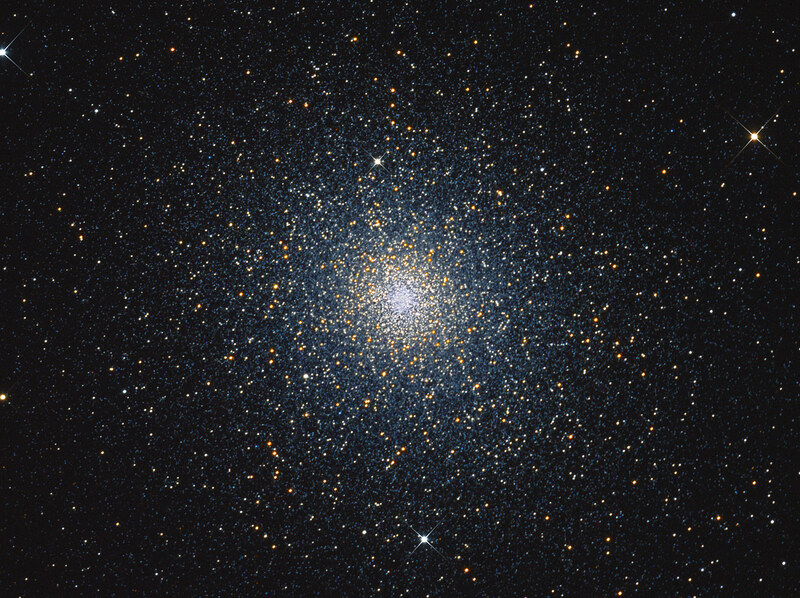 It is one of the largest known globular clusters. Located at a distance of about 13,400 light years from the Solar System, it is bright enough to be seen with the naked eye, being an object of magnitude +4.91.This cluster belongs to the class III, i.e. very concentrated. 47 Tucanae appears to the naked eye as a fuzzy star, not far from the Small Magellanic Cloud. Being so far South, it becomes visible only from the tropical belt of the northern hemisphere, while in places such as Sydney, Capetown or Rio de Janeiro it is circumpolar. Through binoculars it appears as whitish nebulous bulb with soft edges and is much brighter in the middle; through a telescope you can already solve some of its components, which are of mag 13 - 14. 47 Tucanae is a very large cluster : its real diameter is about 120 light years. This makes it, in terms of absolute size, considerably larger than ω Centauri, the brightest globular cluster of the entire sky. Only the central, the brightest part is visible to the naked eye. If we were able to see even the weakest parts (accessible only with large telescopes), it would have an apparent size of about 30 arc minutes, similar to that of the full Moon. 47 Tucanae has very rich in metals stars, in which iron is present in quantity which exceeds with 15% that in our Sun. Its distance is estimated to be about 13 to 14,000 light-years, but it is moving away from us at speed of 19 km/s.